Put one of these on the wall by your door and when someone crosses your threshold, it will alert you. 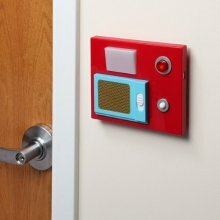 Choose between the door opening sound effect or the Red Alert alarm. The device needs batteries: 3 AA Batteries (not included.) Dimensions: 6 1/2" x 5 1/4" x 1".